Infinite jest. Excellent fancy. Flashes of merriment. I mentioned the primary reason Inside the Outside came to my attention was that its author, Martin Lastrapes, contacted me personally after I commented on a post he wrote. His contact came at a serendipitous moment; I’ve never really run interviews with authors before, but I’ve been corresponding with pen monkey extraordinaire Chuck Wendig, who offered me an interview spot on his site to help with promoting The Prodigal Hour. In addition to writing a ridiculous amount of material and posting every day to his site, Chuck is also a new father, which is to say I sent him answers to the questions he posed but it’ll probably be a couple more weeks yet before he runs it. Will Entrekin: First, Martin, can you sum up the story for anyone who hasn’t read it? Martin Lastrapes: Inside the Outside is about a fifteen-year-old cannibal, named Timber Marlow, who grows up in a cult tucked away in the San Bernardino Mountains. The story on the surface involves Timber’s curiosity for the Outside (which is the mainstream society outside of the cult) and her eventual exploration of it—and all the good and horrible things that follow. Beneath the surface, I like to think it is a simple story about growing up and reaching that point in your life where you realize the world is much bigger than your house or your block or even your city and the requisite curiosity and discovery that comes with it. WE: How on Earth did this gem of a tale come about? ML: Well, the cannibal part came first. I’d become fascinated with writing about cannibalism about 10 years ago, which, not coincidentally, was about the same time I became a vegetarian. For years, I’d kicked around the idea of a society of civilized cannibals, which, to me, was almost scarier than a group of savages. Years later, I decided I wanted to write a novel about a killer. I was a kid growing up in Southern California when the Night Stalker, Richard Ramírez, was out and about, killing and terrorizing, so, as you might imagine, that left a huge impact on me. Pretty early on into the development of Inside the Outside, it occurred to me that I should fuse my fictional killer with my idea of a civilized cannibal society. And everything else sort of developed from there. WE: It seemed to me that, though the prose and style might be what people would call literary, the structure and plot were both tighter than one might expect from such a novel. Were the plot and structure deliberate? Did you/do you outline? How important are three acts for you? Yes, the plot and structure were very deliberate, so I appreciate that you noticed. I love outlining, which I know, for many novelist, is counterintuitive. I outline the entire book, chapter by chapter, which takes me somewhere in the area of one to two weeks to do. By outlining the whole book, it makes it a lot easier for me to analyze the plot and the structure and it makes it extremely easy to monitor the pacing. But, my outlines are also fluid, so if, while I’m writing, I decide to go in another direction with a character or a plot point, I simply go into the outline and make the change. Then I can look ahead and see how that change will effect future chapters and then make the necessary adjustments. So, while it’s a relatively rigid system, there is still plenty of room for improvisation and creativity. The three act structure isn’t necessarily important to me, but I think because a lot of my storytelling instincts come from watching movies my whole life that it is just sort of ingrained in me. So, when I’m working out a story, it seems to naturally break itself into three acts, even without me trying to make it happen. WE: Inside the Outside is classified as horror, but even though it depicts cannibalism, there’s no real gore, or frights. No supernatural entities or things going bump. So what does horror mean to you? ML: I’m glad you asked this question, because I spent a lot of time trying to decide how best to classify Inside the Outside. Horror, for me, is anything that can produce a feeling of terror or dread within a reader, so I think a horror novel is one that aims to produce that feeling of terror or dread. In my case, I didn’t actually set out to write a horror novel (not consciously, anyway), but rather a literary novel about a cannibal/killer. Of course, a story like that naturally lends itself to the elements of horror, but I don’t think my novel fits as neatly into the horror genre as many others do. By the time the novel was done, I knew it was dark and I knew it was scary, so I worried about misleading the reader by not somehow giving them fair warning about the darker, scarier elements. Classifying it as “horror,” in the end, made the most sense. Although, you have previously classified the book yourself as “literary terror,” which is probably a lot more apt. WE: What are your influences as a writer? ML: Probably the biggest influences on me as a writer are the movies. I’ve been in love with the movies for as long as I can remember, long before I discovered my love of reading. Growing up I loved horror movies and watched as many of them as I could, no matter how much they scared me or kept me up at night. Because I came to writing a little later in my life (I was about 18 or 19 when I decided I wanted to be a writer), I had already been tremendously influenced by the movies. So, when I see stories in my head, they’re very cinematic. And as much as I love good literary prose, when I write, my primary goal is not to impress the reader with my prose, but rather to capture into words the movie I’m seeing in my head. But, beyond the movies, in terms of writing, my primary influences are books that are dark, literary, or quirky—and if a book can combine all three elements, then I’m in heaven. Writers like Chuck Palahniuk, Tom Robbins, and Jasper Fforde come to mind. WE: How did you come to independent publishing? ML: I guess I came to independent publishing first out of necessity. The initial goal was to place the book with a traditional publisher, but when that proved to be more difficult than I imagined (and, for the record, I’d already imagined it would be pretty difficult) I started looking at my alternatives. I decided that, in order to have complete control over every aspect of the book, independent publishing made the most sense. Of course, this was daunting because it meant I had to take a crash course on how to publish. One of the great strokes of good luck I had as an independent publisher was having Colin Frangicetto do my cover art for the book. Colin is not only a brilliant artist, but he is also one of the founding members of the band Circa Survive, so this was quite a coup. And if I’d ended up with a traditional publisher, decisions such as the cover art would have been completely out of my hands. WE: You’ve got a bachelor’s in writing and a master’s in composition, yes? How has that affected your work? ML: Both my Bachelor’s degree and my Master’s degree have affected my work exponentially. Earning my Bachelor’s degree, which was in English/Creative Writing, gave me my first opportunity to study literature and creative writing in a focused academic setting. So, in any given semester, I was being exposed to novels, short stories and poetry that I might never have discovered on my own. Then, of course, there were the creative writing classes and workshops that were absolutely invaluable to my development. I also spent some time as a fiction editor for my school’s literary journal, which, in retrospect, was probably very helpful when I decided to go into independent publishing. While my Master’s degree didn’t focus on creative writing at all, it did teach me how to do effective research. And Inside the Outside required a lot of research, so I was constantly drawing on my graduate school experience. WE: What else have you got planned? ML: I’m currently working on a vampire novel, which I’m about 15,000 words into at this point. While it will ultimately fit more appropriately in the horror category, being that I’m dealing with some very traditional horror monsters, it is a lot less dark than Inside the Outside. I don’t really have a set timetable for when it will be complete, but, generally speaking, I would love to have it published no later than 2013. I also have a good idea for a third novel simmering on the backburner, which I’ll work on when the vampire novel is complete. That one will probably be something of a sci-fi/fantasy story…sort of. It will definitely be a little more quirky than dark, and a lot more funny than scary. But, for the sake of mystery, that’s all I can share for now. WE: Where can people find you? Do you have/believe in a strong social networking connection, or are you more interested in the work? ML: People can find me on my author website. They can also find me on Facebook and GoodReads. I’m a big believer in the power of social networking, especially where it concerns independent art of any discipline. Independent artists have always sort of depended on word-of-mouth to help spread the word, so what social networking has done is taken that same idea and multiplied it by a million (give or take). Ultimately, it’s the work that keeps me going. I love writing and telling stories, but, in the end, one of the primary reasons I enjoy telling stories is so I can share them with other people. And social networking offers such an immediate connection between my readers and me that engaging in that world is really a no-brainer for me. WE: Anything in particular/special you’d like for people to know? ML: Yeah, Inside the Outside is available in paperback ($9.95) and eBook (.99¢) on all major online retailers, including Amazon.com and BarnesandNoble.com. If readers want to get a preview of the book, they can check it out at Google Books. I’ll also be doing a book giveaway on GoodReads, which ends on September 2, 2011, so your readers can check that out and sign up for free. And before I go, I just want to thank you, Will, for welcoming me to Exciting Writing and being so supportive of the book. 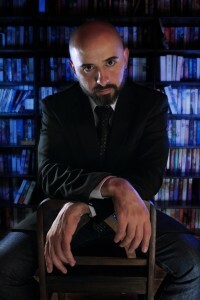 MARTIN LASTRAPES grew up in the Inland Empire. He studied at Cal State San Bernardino, where he earned a Bachelor’s Degree in English and a Master’s Degree in Composition. 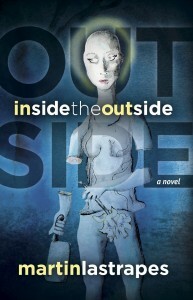 Inside the Outside is his first novel.